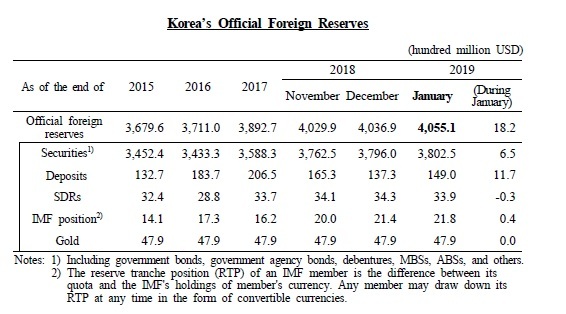 ■ Korea`s official foreign reserves as of the end of January 2019 amounted to 405.5 billion dollars. ㅇ Korea`s official foreign reserves consisted of securities valued at 380.2 billion dollars (93.8%), deposits of 14.9 billion dollars (3.7%), SDRs of 3.4 billion dollars (0.8%), the country`s IMF reserve position of 2.2 billion dollars (0.5%), and gold of 4.8 billion dollars (1.2%). ■ As of the end of December 2018, Korea`s foreign reserve holdings ranked the eighth largest in the world.